I've got a short post today for a quick and easy meal idea when you're cooking for one (as I usually am!). I made this for dinner recently as a way to use up some of the vegetables I had in the fridge, including brussels sprouts and kale. My favourite way to eat brussels sprouts is sauteeing them on the stove, so I knew I wanted to make a sauté. Along with the vegetables, I added some toasted almonds, garlic and shallots, as well as a pinch of paprika and chopped sage for extra flavour. 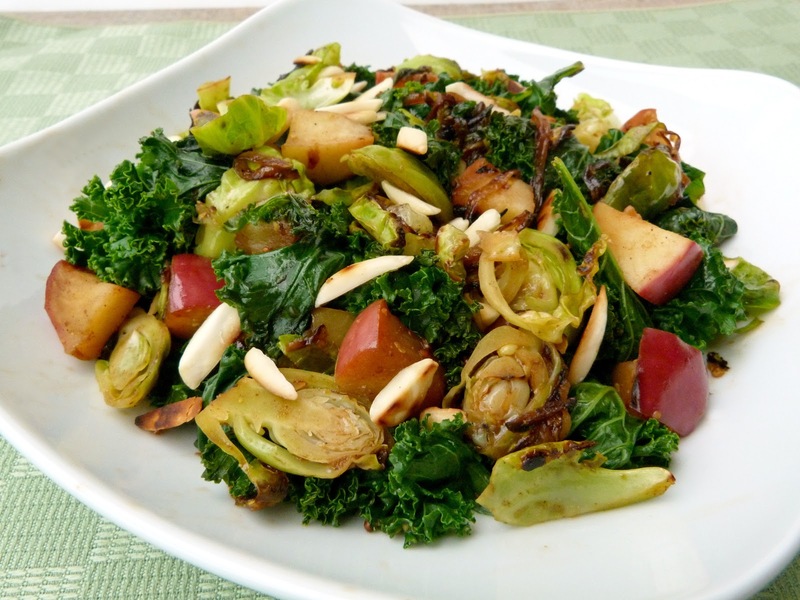 At the last minute, I decided to throw in some diced apple with the kale, and I tossed everything in a sweet and tangy balsamic, mustard and maple syrup dressing. I wasn't expecting much when I sat down to eat my impromptu dinner, but the flavour combination was so good that I had to make it again a few days later so that I could share the recipe with you! I loved how the brussels sprouts got nice and dark and had a sort of roasted, charred flavour. I'm used to eating kale raw but the softened, cooked kale in this dish was a nice change and helped to bulk up the dish and absorb the dressing. 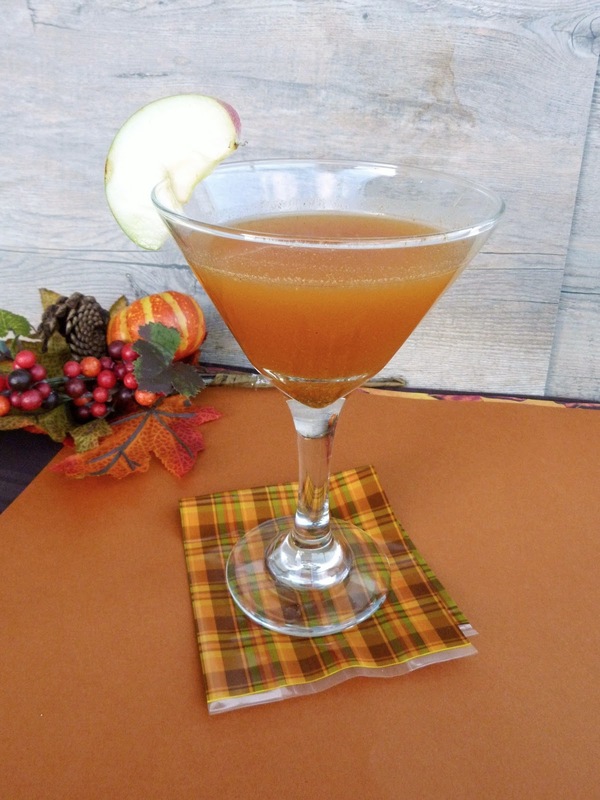 I was also glad that I added the apples, since they added a nice sweetness. Overall this turned out to be an easy and comforting Autumn dinner with lots of deep flavours and textures that I thought went really well together! Heat a small skillet on medium heat. Toast the almonds in the skillet for a couple of minutes, until they are browned. Remove from pan and set aside. Trim the bottoms and outer leaves off the brussels sprouts. Slice each sprout lengthwise into three or four slices. Heat the olive oil in a skillet on medium heat. Add the shallots and cook, stirring often, for 3-4 minutes. Add the garlic and sage and cook for about one more minute. Add the sliced brussels sprouts and sprinkle with the smoked paprika. Season with salt and pepper. Saute for about 5 minutes, stirring occasionally. Toss the apple pieces in a bit of lemon juice. Add the apple and kale to the pan. Sprinkle kale with a bit of salt. Cover pan and let cook for about 5 minutes, stirring occasionally. Remove from heat. Meanwhile, whisk together the balsamic vinegar, mustard and maple syrup. Pour dressing over the contents of the pan and toss to combine. Transfer to a serving dish and add the slivered almonds. One of my favourite quick and easy meals to make is toast with mashed sweet potato. 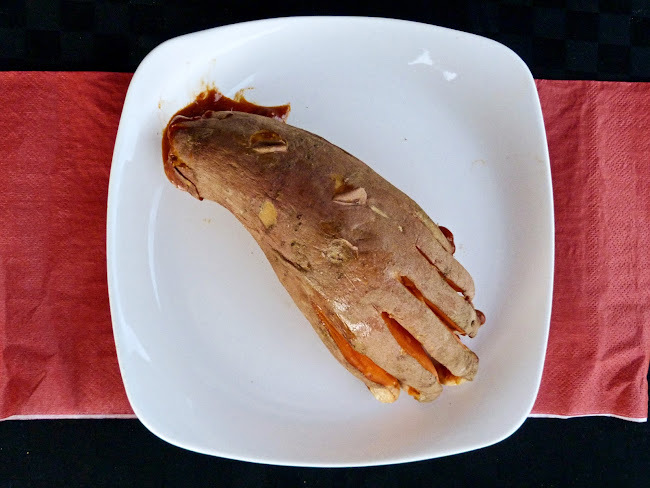 Whenever I have leftover sweet potato, I cook it in the microwave, roughly mash it up, add some cinnamon and maple syrup, and spread it onto toast for a comforting and delicious lunch! 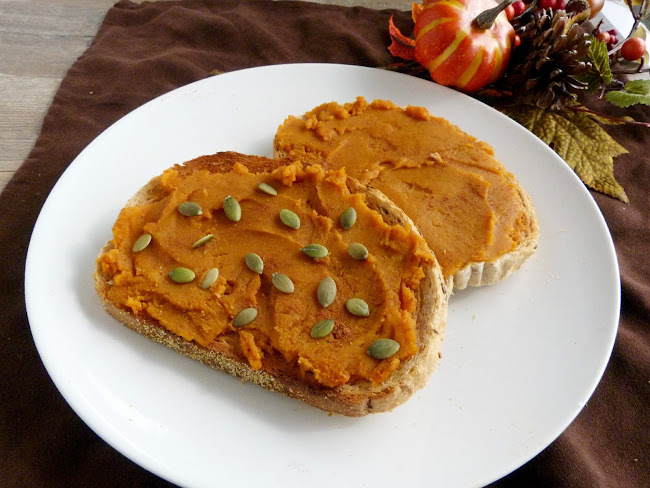 Now that pumpkin season has arrived, I thought that adding canned pumpkin to the mix would be the perfect Fall twist on my usual sweet potato toast, and would complement the flavours really well. 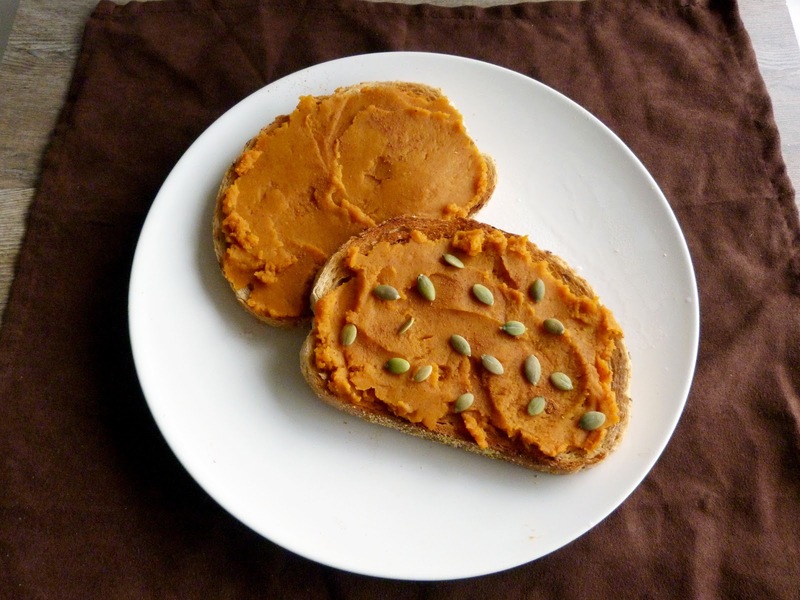 I guess I'm not the first one to come up with this combination, since Kathy already posted an amazing tofu sandwich with a sweet potato-pumpkin spread on her blog Healthy. Happy. Life. Her version was more on the savoury side, so I used her recipe as a guide to create this sweeter spread. You can't really go wrong when you combine sweet potato, pumpkin, maple syrup and warm spices, and the toast is the perfect vehicle for eating the spread. A sprinkle of extra cinnamon on top helps to bring out the Fall flavours, and you can also add pumpkin seeds for a bit of texture and crunch. 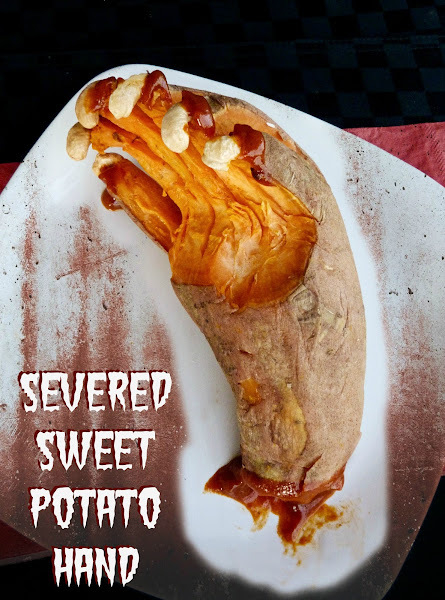 I could eat this for lunch every day for a week and not get sick of it, plus if you're like me and you go through those giant cans of pumpkin very slowly, then this is a great idea for using it up! Once you've cooked your sweet potato, use a potato masher to mash it into a spreadable consistency (I prefer it a bit chunky, but if you want it to be smoother then you can use a food processor instead). 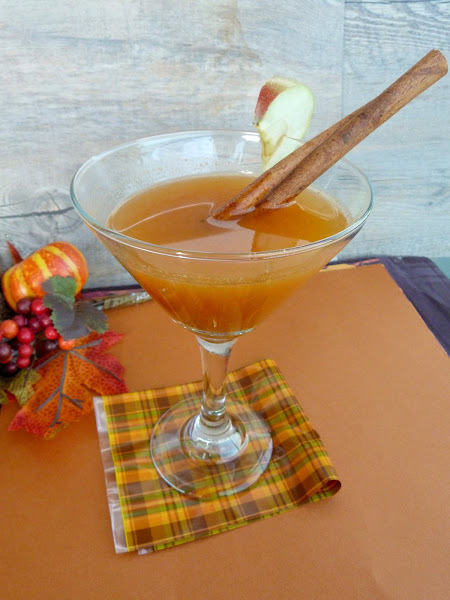 Stir in pumpkin, maple syrup, 1/4 tsp of the cinnamon, pumpkin pie spice, and salt. Taste and add more maple syrup and spices if desired. Warm up the spread in the microwave if desired, then spread onto pieces of toast. Top with the remaining cinnamon and sprinkle pumpkin seeds on top if desired. Makes enough for about 4 pieces of toast. Store leftovers in the fridge if you are not using it all at once. When I came home from the farmer's market this past Saturday with a bag full of green veggies, I knew I had to make a big salad with them for dinner! 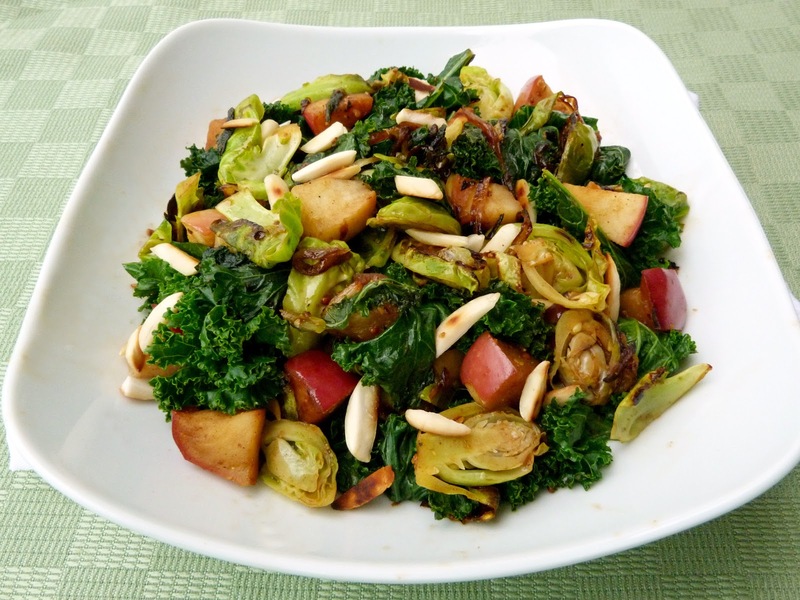 After searching through my bookmarked recipes, I thought this recipe for Kale and Brussels Sprout salad from Bon Appetit sounded like just the kind of light and healthy Fall salad that I was craving. 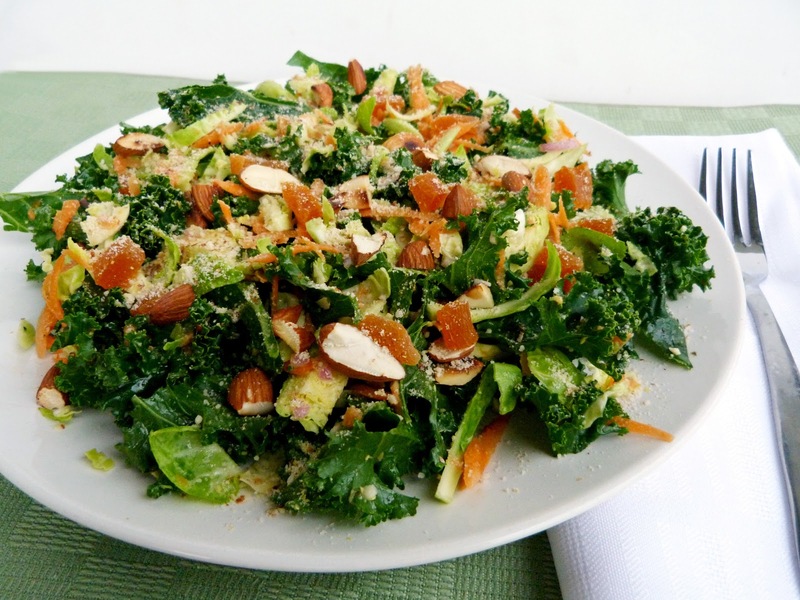 The original recipe was pretty simple, with just kale, shredded brussels sprouts, almonds and parmesan as the main ingredients. For my own version, I scaled the recipe down to a single serving and added some shredded carrots and dried apricots, because I love my salads to be full of different ingredients and textures! I also left out the parmesan and made my own vegan almond parmesan to top my salad with instead. It's actually really easy to make your own by grinding up a small amount of nuts with nutritional yeast and some garlic powder and salt for extra flavour. The topping was probably my favourite part of this salad - I loved the garlicky, nutty and cheesy flavour that it added! I also loved the lemony dressing that soaked into the greens and softened the raw kale a bit, and the layers of crunch from the raw brussels sprouts and the almonds. 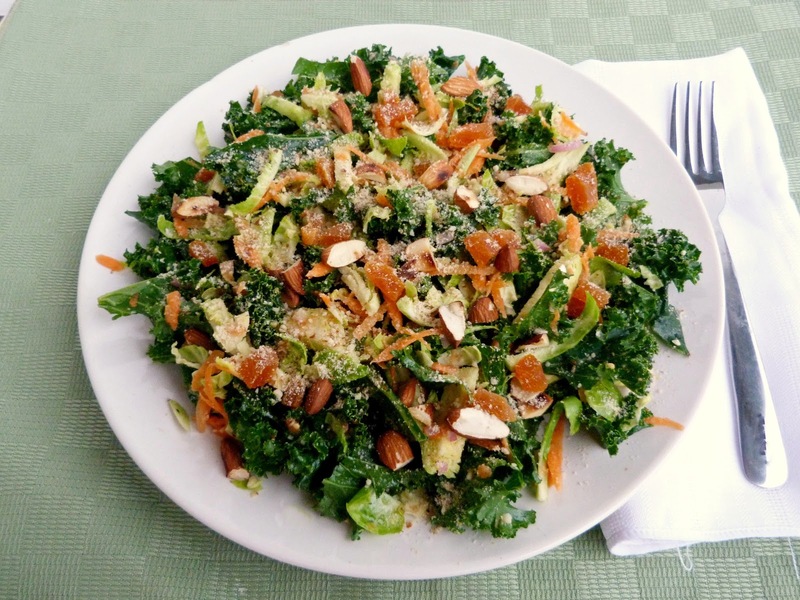 If you're not afraid of eating raw kale and brussels sprouts, then you'll love this salad, or if you haven't tried raw brussels sprouts before, then here's your chance! Make the parmesan topping: add all ingredients to a food processor or a blender that has a grind/crumb function and process until finely ground. Set aside. Make the dressing: Whisk the first four ingredients together in a small bowl. Add salt and pepper to taste. Whisk in 1 tbsp of olive oil. Place the shredded kale in a large bowl. Cut the bottom ends off the brussels sprouts. Slice lengthwise into thin slices, then slice the other way so that you get thin shreds. Add the brussels sprouts to the bowl with the kale. Peel and grate the carrot and add to the bowl. Toast the chopped almonds in a dry skillet on medium heat for 2-3 minutes, until they are lightly browned and fragrant. Add the toasted almonds and and chopped apricots to the salad and mix. Pour dressing over the salad and toss to coat. Sprinkle as much of the parmesan topping over the salad as you like (I didn’t use the full amount). Season with additional freshly ground pepper if desired. Note: if you find your salad too dry, add another 1/2 tbsp of olive oil and another squeeze of lemon juice. Note: I think the salad is best if you let the dressing soak for 5-10 minutes before eating. 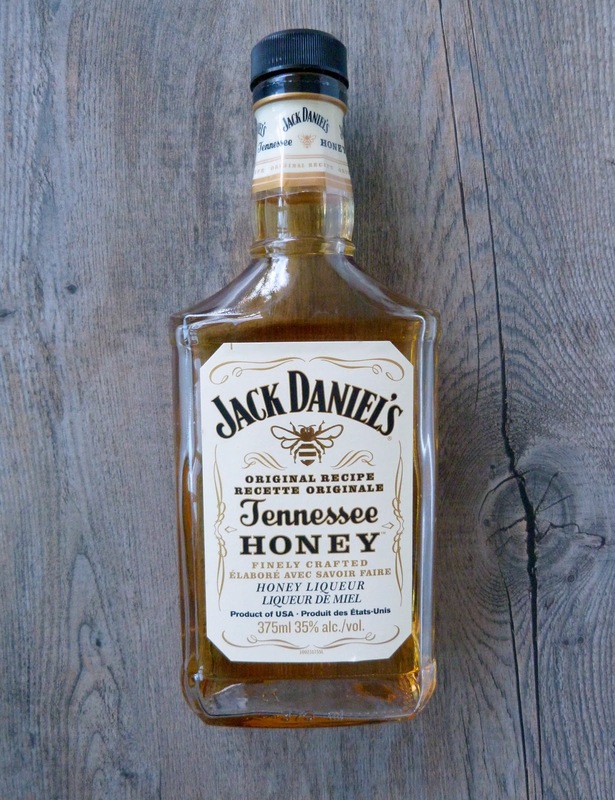 Makes 1 large serving, or more as a side dish. As promised, I'm back with a recipe that I had made before my trip! If you've been reading my blog for awhile, then you already know that I love Indian food. And while I do enjoy bowls of rich curry, my favourite type of Indian food is chaats - street food and snacks. I love the mix of sweet, spicy, and sour flavours and the combination of fresh toppings, chutneys and cool, creamy yogurt that are typically featured in chaats. This roti wrap is my own take on Indian chaat. 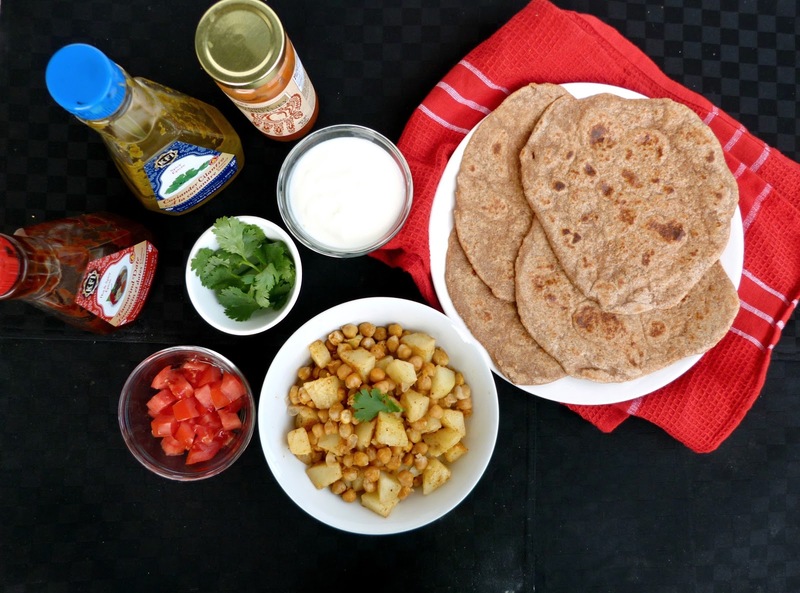 I made a simple aloo channa (potatoes and chickpea) filling, which I layered onto a freshly made roti bread, topped with chopped tomatoes, cilantro, sev, yogurt, and two types of chutney. 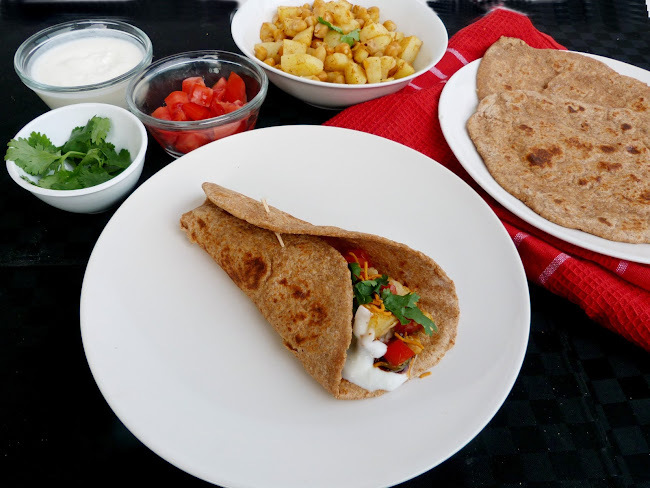 It may sound like a lot of work to make your own bread, make the filling, and prepare all of the topping ingredients separately, but there are a couple of shortcuts you can take to make the process even easier, like making the roti and filling ahead of time. 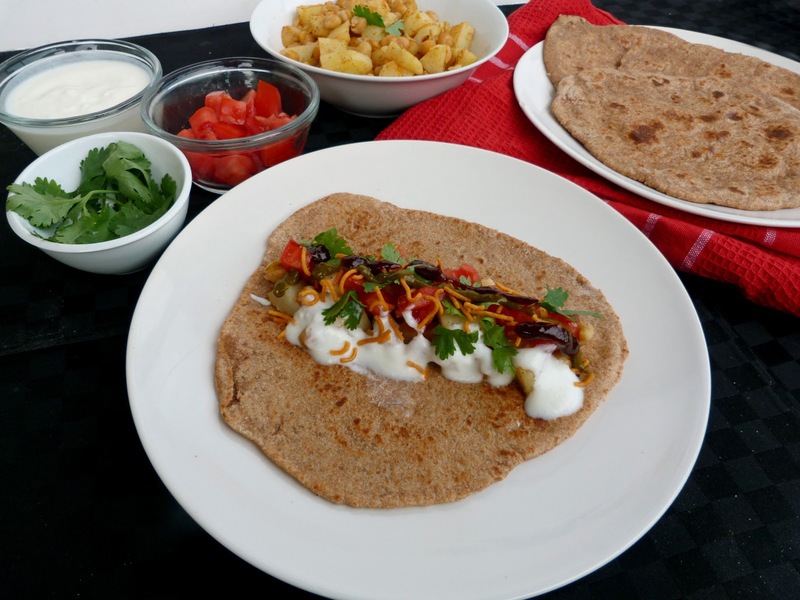 For the roti, I used this recipe for 5-minute whole wheat naan from Food Doodles. I would recommend this recipe to anyone who has never made Indian flatbread before, since it's very easy to follow. 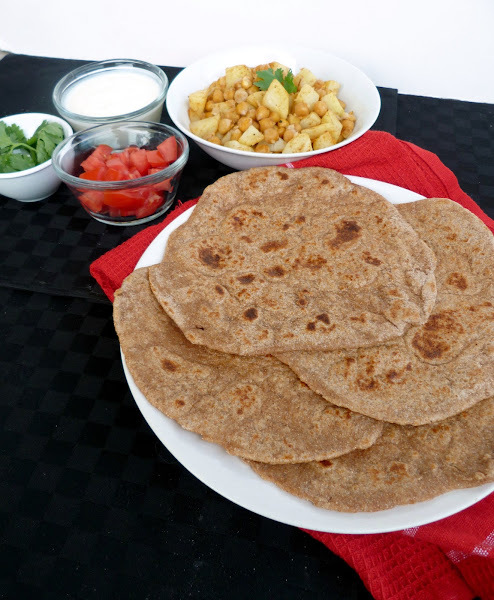 And once you get some practice at making your own roti, the process becomes really easy - you just mix a simple dough, let it sit, roll it out, and cook it on the stovetop for a few minutes! This particular recipe gives you 4 thin and flexible wraps that are perfect for rolling up around any filling you like. They are best eaten fresh and warm, but if you have leftovers, they can be wrapped up and stored on the counter or in the freezer. Once the rotis and the filling are made, you can customize your wraps with the amount of toppings that you like! (Note: you can even make the filling ahead of time and reheat it when you're ready to eat). I like to eat mine with lots of tomatoes and cilantro, and I also added some sev noodles (a crispy fried Indian snack) that I had in my pantry for some extra crunch and spice. The best part, in my opinion, is to pour on lots of plain yogurt and generous squeezes of both tamarind and spicy green chutneys. I like to use about equal amounts of each one, but it depends on how spicy you like your food! I loved the combination of ingredients in this wrap - it was spicy mixed with sweet and tangy; warm, cool, and fresh - all at the same time! I doubt you would ever find anything exactly like this on the streets of India, but the flavours definitely brought me back to the time I spent there and some of the delicious street food that I ate! Make dough for naan, following the instructions in the link above. Place potatoes in a pot of water and bring to a boil. Reduce heat to medium-high and simmer, uncovered, until tender when pierced with a fork, about 15-20 minutes. 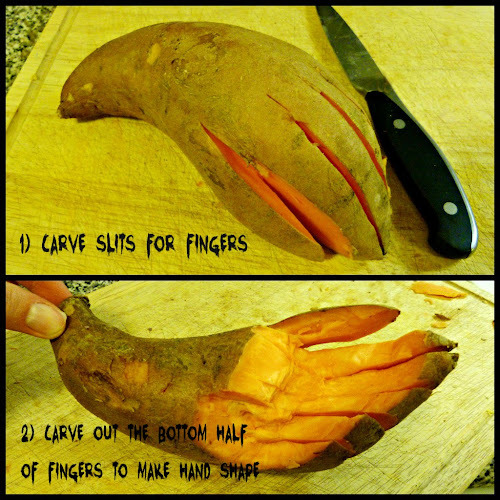 Drain and cut into small pieces. Set aside. Heat skillet for cooking the naan. When naan is finished, keep covered with a towel. Reduce heat on the stove to medium-low and add a bit of vegetable oil to the skillet. Add the chickpeas and heat for a couple of minutes. Add the potatoes, a couple dashes of chili powder, a dash of salt, chaat masala, and lemon juice. Stir and cook for a couple more minutes, until heated through. (Note: you can leave the chickpeas whole, or mash them a bit for a smoother filling). To assemble wraps, spoon some of the chickpea-potato mixture down the middle of a piece of naan. Top with your choice of toppings – I recommend a couple spoonfuls of plain yogurt, diced tomatoes, cilantro, a pinch of sev noodles, and equal amounts of spicy green cilantro chutney and sweet tamarind chutney. Makes enough for at least 4 wraps. Hello again! 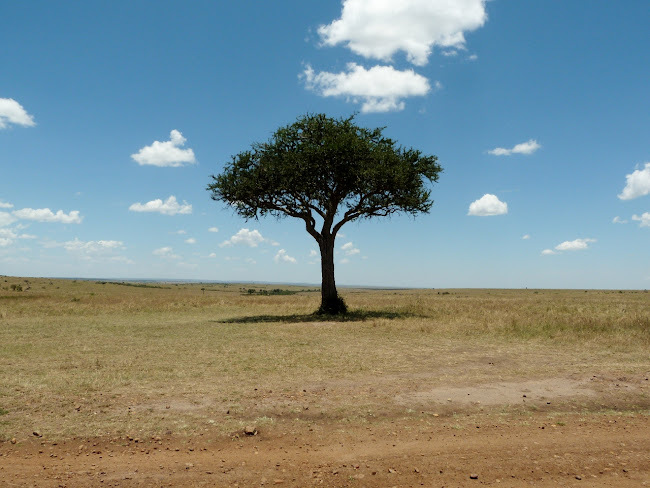 In case you missed my last post, the reason I've been absent for the past couple of weeks was that I traveled to Kenya for a workshop and then stayed on for a short safari vacation. I had the greatest time - I can't even describe how amazing it is to observe wild African animals up close in their natural environment! I won't spend this entire post describing my safari experience, because I know you are all here for the food! 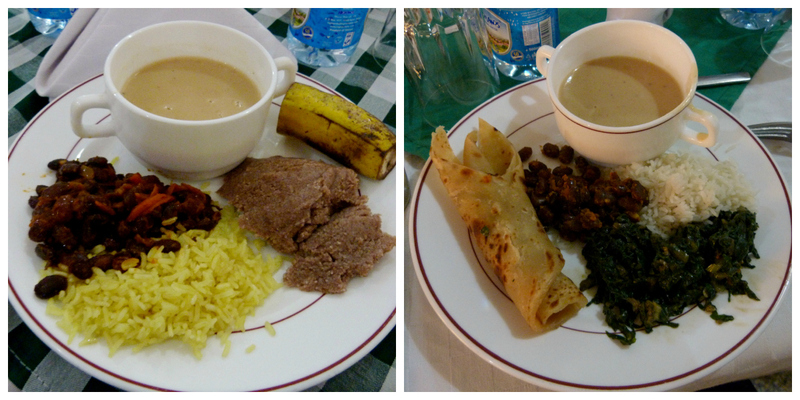 Instead, I thought I would do another "What I ate in..." post to share some of the dishes that I sampled in Kenya. 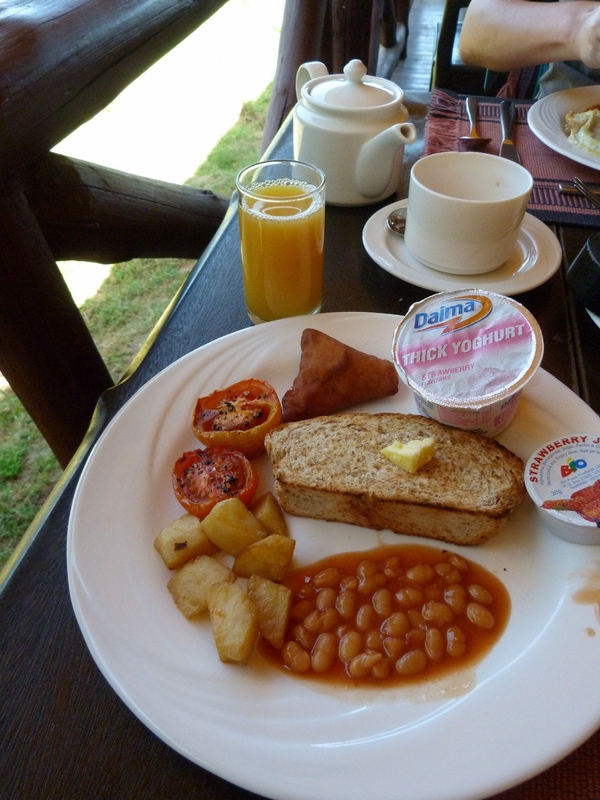 As I found in Zambia, a lot of the food offered at our hotels was Western style, especially at the place we stayed in Nairobi. We did get to try some of the local dishes though, and there also seemed to be a lot of Indian food available too, which was great for me! Luckily, I never really had a problem getting vegetarian meals. There were a few places where the vegetarian options were extremely limited, but at least I always had something to eat! And the lodge we stayed at on safari served all the meals buffet-style, with plenty of vegetarian dishes to choose from. 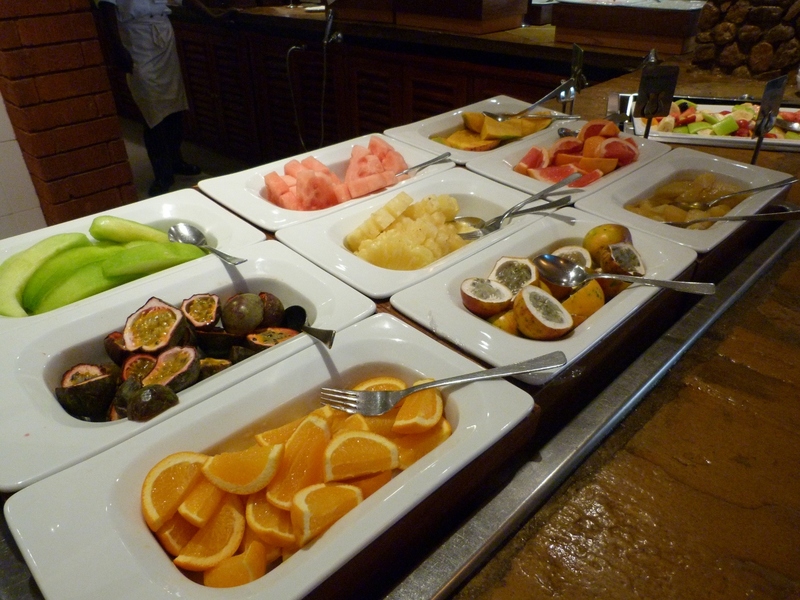 I always looked forward to breakfast because of the variety of fruits available. The bananas, mangoes and pineapple were always perfectly ripe and juicy, and I even tried a new kind of fruit - tree tomato. Even though I didn't enjoy it at all, at least I can say I've tried it! The rest of my breakfast would typically include toast, yogurt, tomatoes, potatoes, and sometimes mushrooms or baked beans - nothing special but I always ate a lot of it because we would wake up early and needed a big meal to keep us going until lunch time! 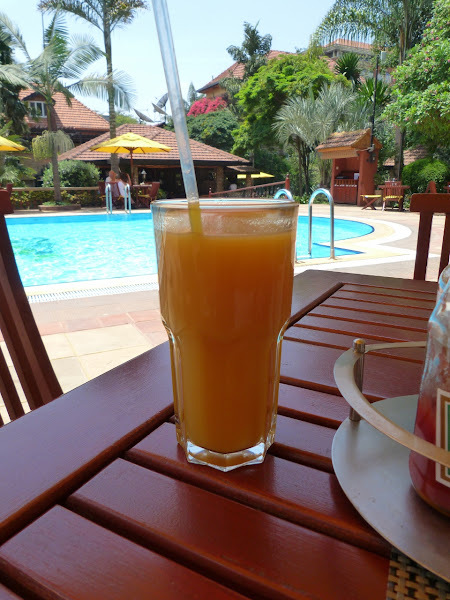 Of course, my breakfast would always include plenty of juice - while it wasn't always freshly squeezed, I loved the tropical flavours: mango, pineapple, and passion fruit (which I liked to mix sometimes too). Looking at this photo of the mango juice I enjoyed by the pool makes me wish I was back someplace warm again! 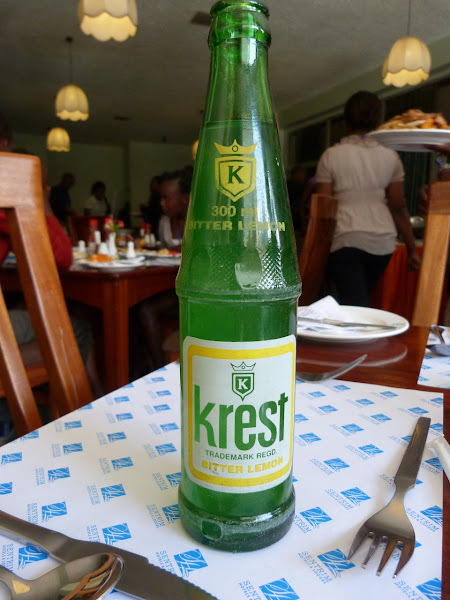 Other than juice, it seemed that soda was very popular in Kenya. At lunch, we were usually offered a choice of Coke, Sprite or Fanta (they even had a pineapple flavoured Fanta, which I'd never seen before). I tried a couple of locally made sodas from the brand Krest. One was a gingerale, and the other was this unique bitter lemon soda - it reminded me of club soda but with a nice lemon flavour. As I mentioned, I ate quite a big variety of food while I was there, from Western to African to Indian, but I'll try to only share the local dishes because I know you've all seen stir-fries, salads, and curries before! 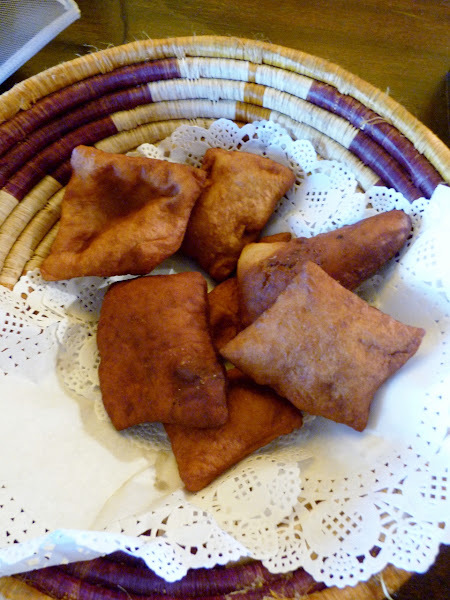 One of the foods that I was a bit surprised to learn was a Kenyan specialty was samosas. 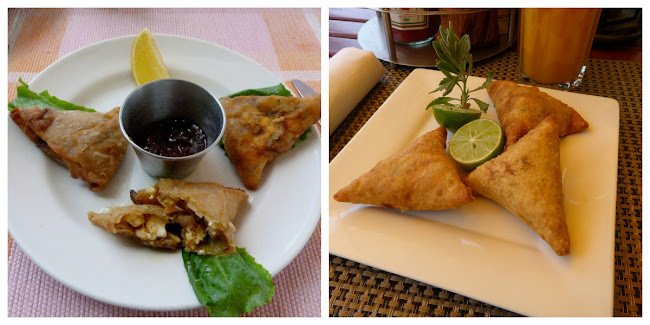 I tried two different versions, and both were served with a bit of a twist on the Indian samosa. The version on the left was filled with feta cheese and vegetables, with a tomato chutney. I liked the filling and sauce, but they were too greasy to finish. The ones on the right, however, were some of the best samosas I've ever had - the vegetables were done perfectly and they had lots of spice. Instead of eating them with chutney, they were served with a squeeze of lime - a nice way to highlight the flavours of the samosa. 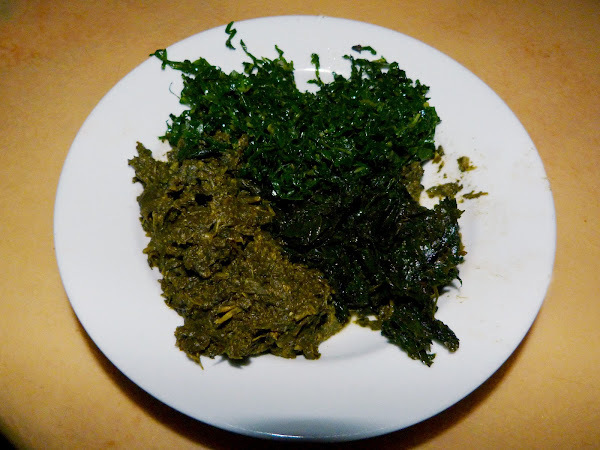 Two of the local specialties that are commonly eaten as staple foods in Kenya are ugali and various types of cooked greens. Ugali is a side dish made from maize flour and cooked to a thick dough-like consistency. There were two types - brown and white - and you're supposed to eat it with your hands together with vegetable or meat stews. 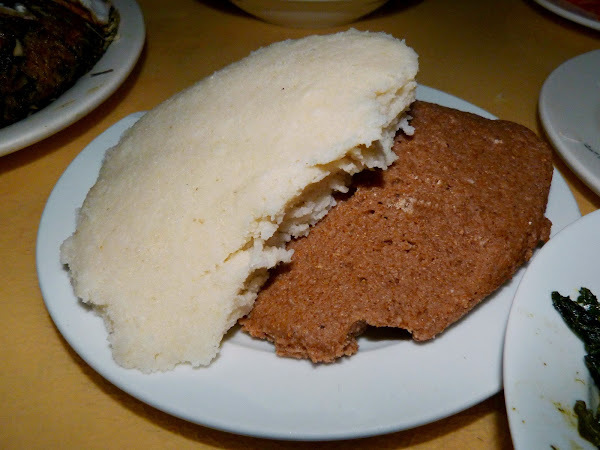 I first tried the ugali at a local restaurant that served authentic dishes. Pretty much all of the options on offer were meat or fish, so my dinner consisted of the side dishes - ugali and lots of cooked greens! They offered three types of greens - I'm not actually sure what each one was, but they typically use kale, spinach, and collards. Each one was slightly different - the one on top was called sukuma wiki and was mixed with onion and tomato, and the one on the left (my favourite of the three!) was more thick and liquidy. I found them to be a bit on the bitter side, and they certainly didn't look very appetizing, but they made a tasty and filling meal combined with the ugali. 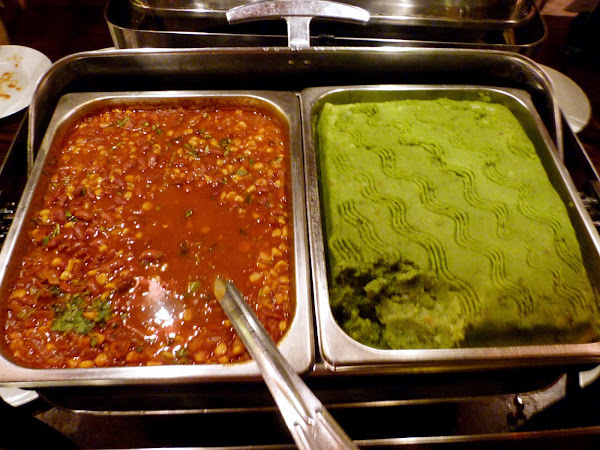 Another type of Kenyan dish that I found interesting was their versions of mashed vegetables. I tried a dish of mashed potatoes that contained spinach and chewy corn kernels - it tasted good, but it was a bit odd eating chunks of corn in my mashed potatoes! Another version that I really liked was the dish on the right above - I never figured out exactly what was in it, but it tasted like mashed potatoes with peas and actual pieces of cooked potato. The colour was definitely interesting! Most of my meals also started with a vegetarian soup, usually cream-based. I tried spinach, mixed vegetable, mulligatawny, asparagus, carrot-orange, and onion soups, but two favourites stood out. First was this spiced pumpkin soup that I ate at a restaurant outside Nairobi. It was a smooth and creamy soup with lots of squash flavour and I could really taste all the spices. My other favourite soup - and possibly my favourite thing that I ate altogether on my trip - was a creamy peanut soup. It was slightly on the sweet side, and had just the right amount of peanut flavour. 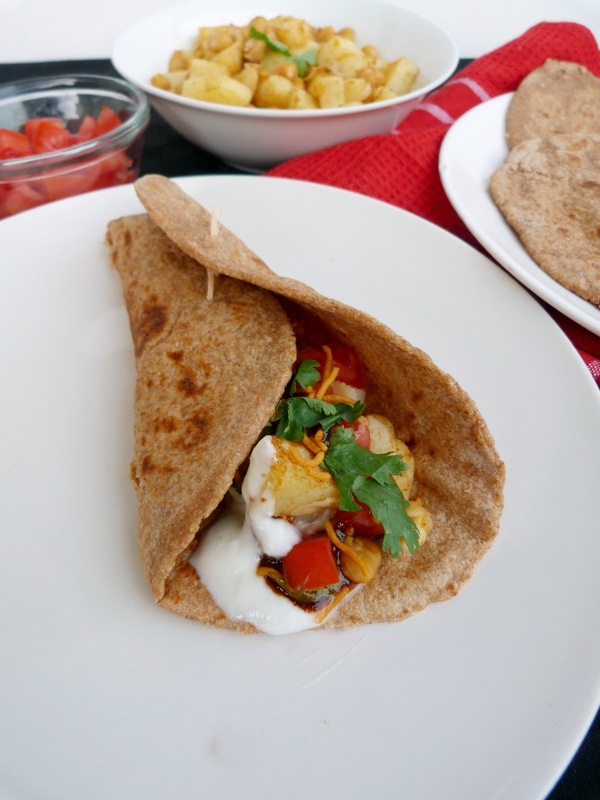 It was delicious on its own, but even better when I dipped my thick chapati in it! 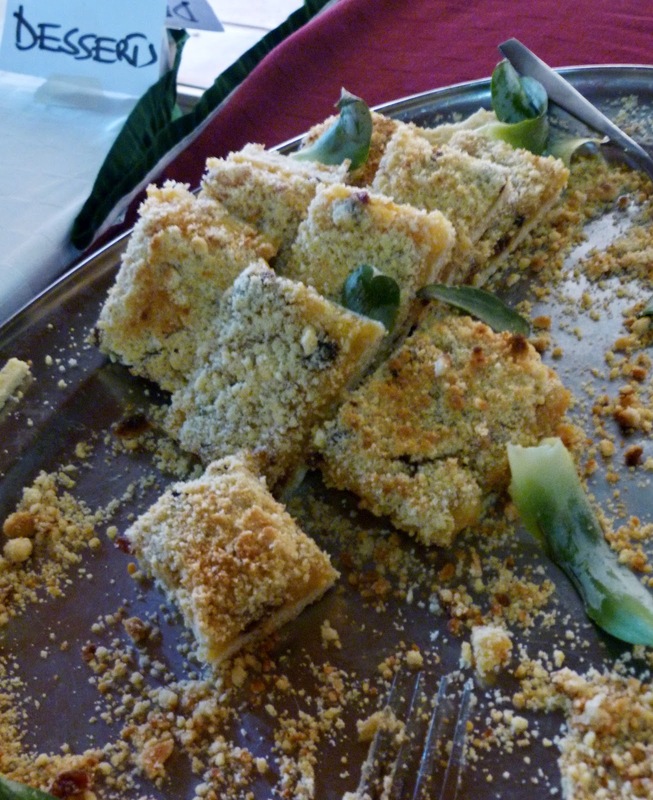 Luckily for me, it was offered twice as part of the lunches served during our week-long workshop! Here are a couple of pictures of what the lunches typically consisted of - a soup, beans, rice, and sometimes greens or other vegetables. One day we got to try the brown type of ugali (on the left), and on the right is the rolled chapati - it was thicker than the chapati that was served at other restaurants I went to, but personally I liked it that way! When it came to desserts, the choices were pretty similar to what you would find anywhere - fruit salad and various types of cake. I usually stuck to the fruit because I'm not a huge cake fan, but I occasionally gave one of the other options a try too! One of the local specialties that I tried were the Kenyan donuts, called mandazi. I found them pretty plain - to me, they just tasted like fried dough - but I liked to dip them in my coffee! Another more unique type of dessert that I came across a couple of times were baked goods made with pineapple. One restaurant offered a pineapple pie, which was just like apple pie but with a pineapple filling. I also got to sample these pineapple crumb squares shown below. I loved both desserts - I don't know why they're not more common in North America! That's all for the food highlights of my trip, but for anyone who is still interested in the safari portion, I'll end with a few highlights of the animals I saw during the few days I spent in the Maasai Mara reserve! Since we were there during the end of the migration season, there were literally millions of zebras and wildebeest around. 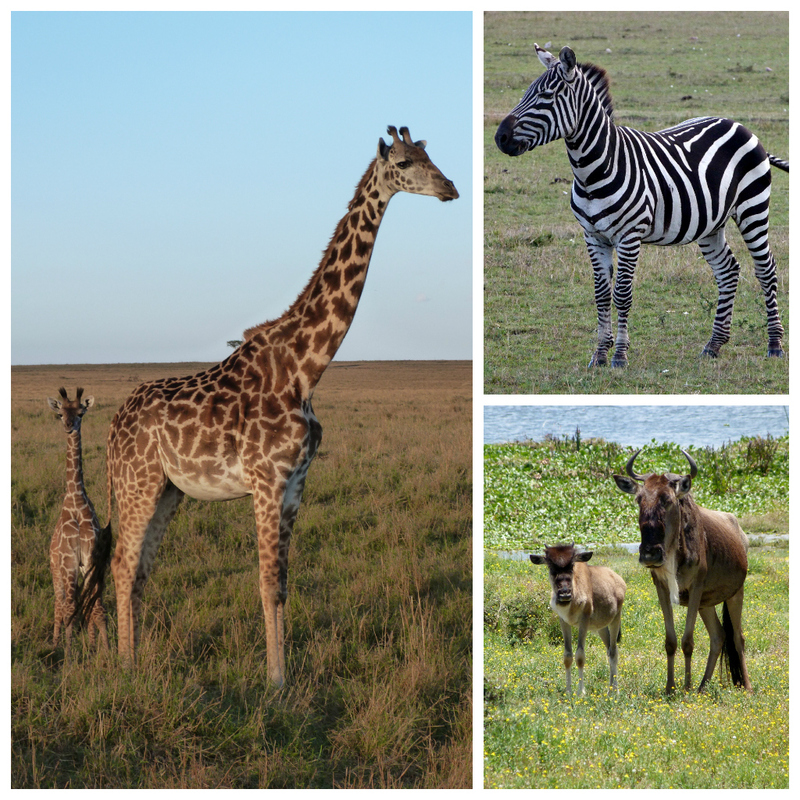 We also got to see many giraffes, including lots of babies! I loved watching the giraffes walk around - they are so beautiful and graceful. 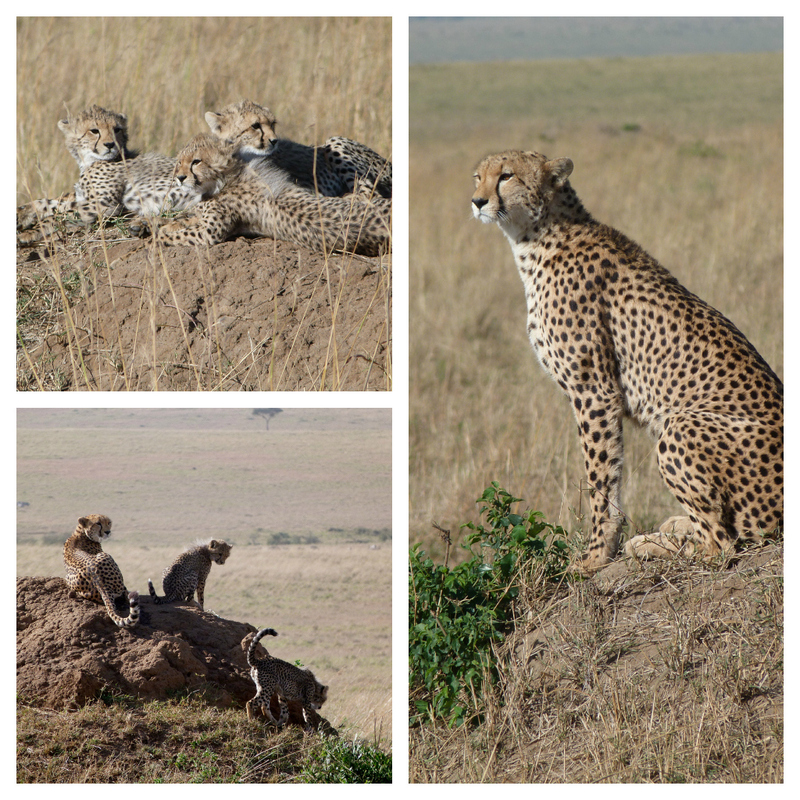 We also came across a mother cheetah with her four cubs - the cubs were adorable and the mother was so sleek and gorgeous! 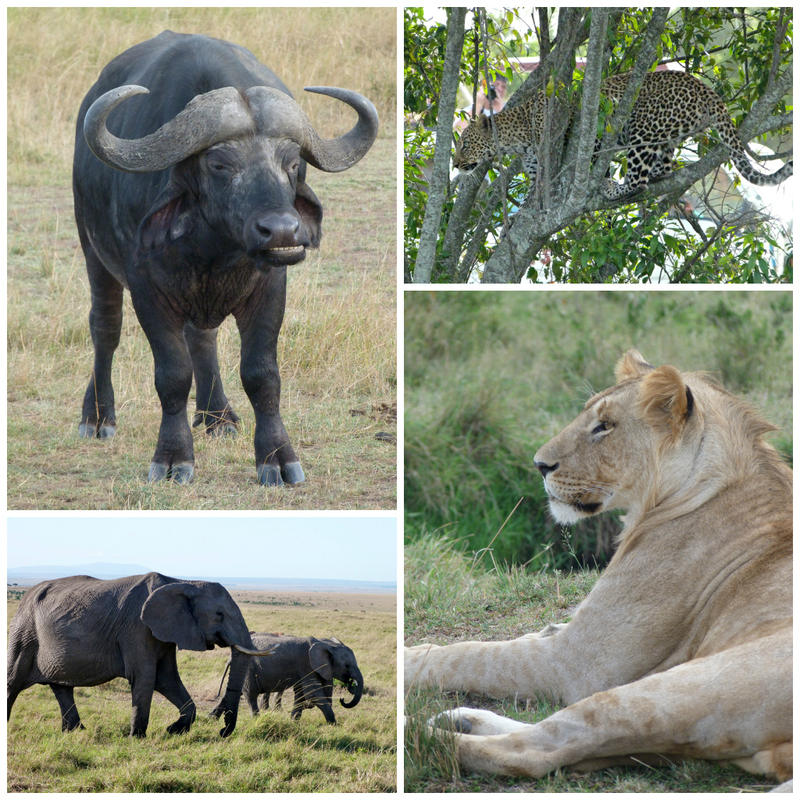 Out of the "Big Five" animals, we managed to see four of them: cape buffalo, leopard, lion, and elephant. The only one we missed was the black rhino, which was really difficult to find, but the fact that we were lucky enough to see the elusive leopard made up for it! I loved every minute of being out in our van searching for wildlife and being able to see so many beautiful animals right in front of my own eyes. And now that I'm back to reality, I'm excited to get back into Fall cooking and baking and catch up on everything that happened in the blogosphere while I was away! If you're still reading, thanks for following along with my Kenyan experience and I'll be back with an actual recipe as soon as I can!